Conceived for kids, built for adults: Bernd Pennewitz makes iconic Porsche replicas—in miniature form with electric drives. An old journalist’s axiom holds that children and animals always make for good stories. Hardly anyone can resist the charm of an adorable infant or the eyes of a loyal hound. Add a sports car, such as a Porsche, and you’ll automatically end up with Bernd Pennewitz and his children in the town of Lüdersfeld in the Schaumburg district of Lower Saxony. Boys prefer technology and like playing with cars, while girls are more socially attuned and like playing with dolls. Or so it’s said. Bernd Pennewitz’s daughters turn such hoary clichés on their heads: these girls drive Porsches. Test drivers Ida and Paul (on assignment for the editorial staff) familiarize themselves with the technology in a miniature Porsche 356 outside Pennewitz’s workshop. Their father was an avid collector of Wiking toy cars as a boy. In 2000 he started exploring how his personal passion for model cars might be used to enhance the family’s dollhouse. Two years later, the result was a silver James Dean Porsche 550 Spyder, a miniature vehicle measuring 160 centimeters in length and powered by an electric drive. This precisely scaled and detailed replica had everything from a fold-up rear end and tiny instruments to an ignition on the right side of the wheel. 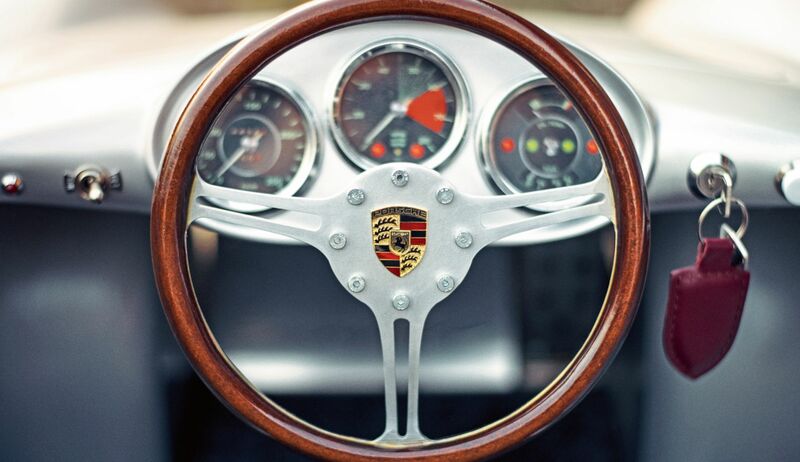 Pennewitz has since become a graphic designer and runs a design agency in his chosen field of classic Porsche cars constructed at a scale of 1 to 2.3. And he’s achieved legendary status among model builders. Pennewitz threw himself into his work. 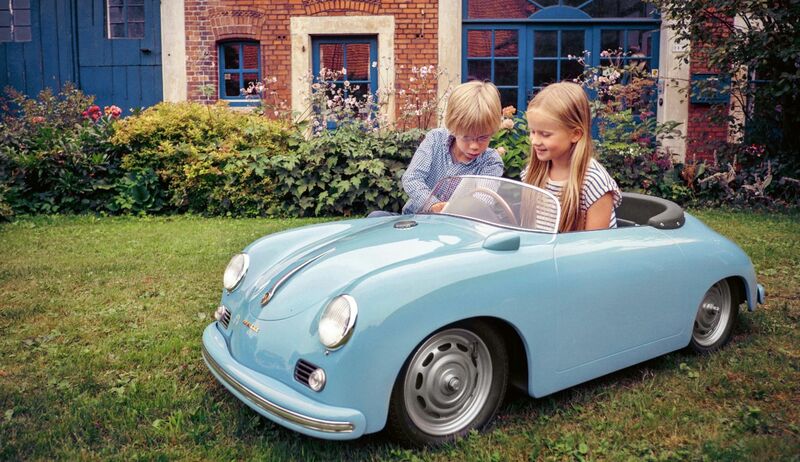 To help finance his start-up, he sold his real Porsche 356. The requisite technical expertise and craftsmanship were “essentially already there.” His previous work on design objects for trade fairs and marketing projects was helpful in building the car bodies. He fashioned the initial shape of the 550 Spyder’s outer shell from a block of rigid foam. “I set about cutting, grinding, cutting some more—first with a chainsaw, then with ever more precise tools.” Once half of the model was shaped, he used templates to transfer it to the other half. 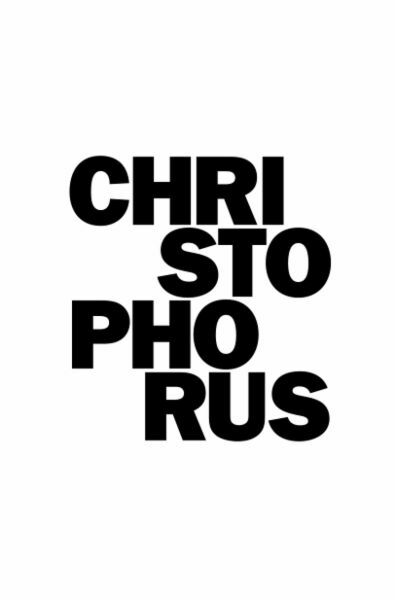 The chassis was designed on the computer, and its components and the baseplate were laser-milled from steel and aluminum. The question of what type of drive system to use solved itself. For safety reasons, a combustion engine was out of the question. Pedals weren’t an option because the miniature Porsche was too close to the ground for kids to effectively churn their legs. Pennewitz quickly found a suitable electric motor. “A lot of precision work went into getting the drive system to harmonize with the mechanics. But of course I’m proud of the fact that I basically built the first series of E-Porsches,” he adds with a wink. What this one-man operation needed for series production was a network of suppliers—all the more so when he developed a second car, this one modeled on the 356 Speedster. He found skilled providers for the plastic car bodies, but spent sleepless nights worrying about the paint jobs. “Painting plastic is a supreme skill in this industry. I spent years trying to find a company that could do what I needed.” The search for turn-signal lights, wheels, and other special parts was no less time-consuming. Pennewitz and his wife managed to locate a number of items online that could then be adapted. But some things were impossible to find, like headlight covers. Pennewitz had to make the molds himself to have the thermoplastic parts cast. But how does he sell his precious creations? “There’s a surprisingly wide range of customers,” he notes. And then adds that discretion is a matter of honor in this business. That makes sense—the price for one of his 356s starts at €10,000. Hence many vehicles in his fleet are probably driven on winding roads through park-like estates. But Pennewitz is adamant that he does not advertise his products as children’s cars. For one thing, this would lead to problematic liability issues. Aside from that, an astonishing number of buyers are adults who have simply fallen in love with his little classic cars. “One of our first customers was a man who ran straight up to our stand at the Techno Classica fair in Essen and shouted, ‘I want this, where do I have to sign?’” he recalls. Other interested parties turned out to be owners of 356s who wanted to have exact miniature copies parked next to their originals. Pennewitz has now made more than 150 small cars, including models of the equally legendary Porsche 904 GTS. Of course he has also considered the daring step of making a 911. But for that he would need a sponsor to finance all the development work, like with the 904. Pennewitz hopes to turn over his oeuvre to younger hands and is looking for someone who shares his passion and commitment. This man, who has never actually sat in one of his cars, wants to continue having fun building them. 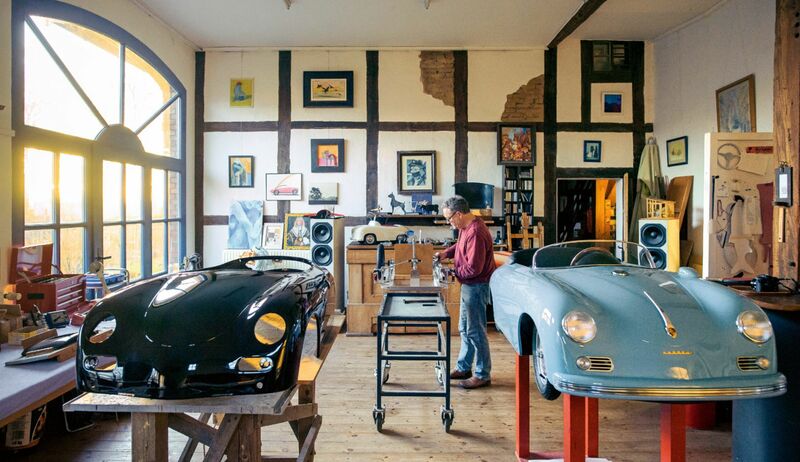 For even if Pennewitz sends his little Porsche gems from Lüdersfeld to the far corners of the earth, he ultimately makes every single one of them for himself. Of course, because that’s where it was in the original Porsche 550. This miniature Spyder reflects the full-sized original in everything down to its instruments and spoked steering wheel.